Lately, I’ve been feeling like I’ve got about 10 hours worth of work to do and only 3 hours to do it in. I come home from work, make dinner, spend a small amount of time with the kids, and get them into bed. Then, I’ve got about 3 hours to get everything else done. By “everything else”, I mean clean up from dinner, work on my blog post, and work on the various freelance projects I have to complete. Add in a kid (or 2) waking up as I’m actually heading to be and I’ve gotten to sleep at about 1am every night this week. It wouldn’t be so bad if I could sleep in, but B has this annoying habit of getting me up in the morning so I can go to my day job. Sheesh! There’s a mountain of things I’d like to do. FollowerHQ needs some improvements, I’d like to read up on coding applications for Android devices, I’ve got my tie clip project, I still want to woke out a system to stream movies from our computer to our TV, and more. This pile keeps calling to me, but I need to push it off. The things I *have* to do keep draining time from the things I *want* to do. I feel like I’m running on a treadmill at top speed and still slowly falling behind. In short, I’m feeling overwhelmed and like I’m headed for a burnout. 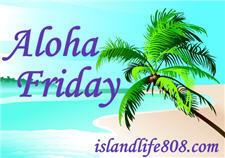 My Aloha Friday question for today is: What do you do when you feel overwhelmed?